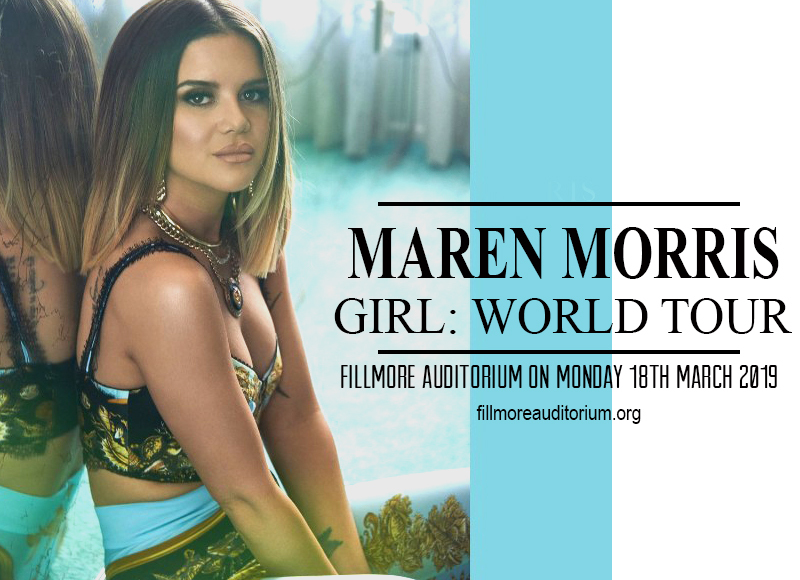 Catch Maren Morris live as she takes center stage at the Fillmore Auditorium on Monday 18th March 2019. This country pop star has crossed over and conquered new heights in the realm of electronic dance music with the chart-topping single "The Middle". She was hand-picked by premiere DJ Zedd and Grey to be that voice that has kept this dance ditty spinning wildly at the top of the global charts. With that, she ushered in 2019 with a headlining tour dubbed as "Girl: The World Tour", taking her to over 40 cities then stretching through parts of Europe and New Zealand. Morris' fans over here are lucky that this show is just within reach. You don't even have to leave your seat. With a click, you'll be well on your way to savor, enjoy, and get a kick of energy from the sensational Maren Morris. No time to waste, book your tickets now! Maren Morris is an established country-pop singer-songwriter who has best-selling albums, chart-topping singles, and a Grammy award to her name. Her debut album entitled "Hero", reached number five on the Billboard 200 chart and number one on the Top Country Albums chart. She quickly rose to fame with her debut single "My Church", which peaked at number one on the Country Digital Songs chart in 2016 and reaching the top five on the US Hot Country Songs chart, then clinching a Grammy win for Best Country Solo Performance. From lording over the country music landscape, Morris conquered new a soundscape as she crossed over to the realm of electronic dance music. She provided lead vocals for the song "The Middle" in collaboration with Zedd and Grey. The massive airplay and chart action of "The Middle" propelled her to mainstream pop music success as the song peaked at No. 5 in the US and received three nominations at the 61st Grammy Awards. With all these sensational credentials, Maren Morris is indeed ripe and ready to take on the world stage. She is currently on headlining a global concert trek entitled "Girl: The World Tour", in support of this new single which she dropped sometime in 2018 and is massively hitting charts everywhere. Be there to witness this spectacular show. Get your tickets now!